I recently catalogued a book from 1927, Der Niederrhein im Schrifttum alter und neuer Zeit (S950.b.9.1244), an anthology of writing about the Lower Rhine region of Northern Germany, illustrated with the most striking woodcuts. Some of these date from pre-1500 as the example to the right (or above if viewed on mobile phone) illustrates, but the majority are contemporary Expressionist works created by either Artur Buschmann or Anton Wendling, both artists I had not heard of before. 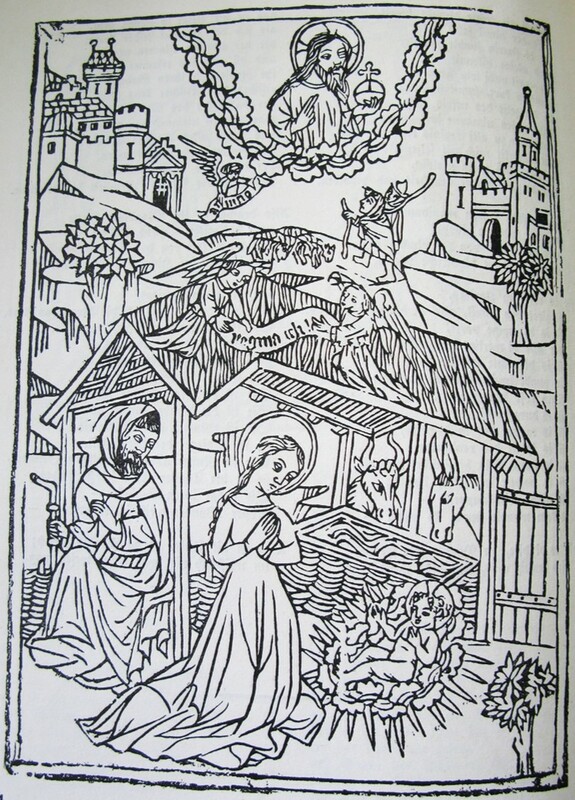 The woodcut as a medium was particularly used by Expressionist artists in Germany. In October 1866 Lewis Carroll told his publisher Macmillan that his friends in Oxford “seem to think that the book [Alice’s adventures in Wonderland] is untranslatable”. History has proved his friends very wrong, as a new three volume acquisition by the Library, Alice in a world of wonderlands : translations of Lewis Carroll’s masterpiece, edited by Jon A. Lindseth (S950.b.201.3527-3529), makes clear. We have recently started to catalogue various reference works transferred to the University Library from the Modern and Medieval Faculty Library’s Balkan section. Most are academic dictionaries, but among them is the delightful 1938 Croatian picture dictionary Sta je sta (What is what). Each opening provides often quite complex terminology facing illustrative pictures. Produced by two academics and writers, Iso Velikanovic and Nikola Andric, the 685-page dictionary covers a huge number of topics in quite extraordinary detail. Even cricket is included. ‘Kniga dlia detei 1881-1939’ (Books for children, 1881-1939; S950.a.200.4173-4174) is a huge two-volume set which contains reproductions of excerpts from beautifully illustrated Russian children’s books. It was produced in 2009 but is a only a recent arrival in the University Library. The two volumes (right) and a winter scene (left). We write quite frequently on this blog about donations to the University Library, not because this material necessarily makes up a large proportion of what we acquire, but more probably because we (the people writing these posts) find old books to be interesting. That is the case with a dozen volumes that we accepted as a donation in the series Le livre de demain, published by Arthème Fayard. I’m sure the novels in these books are worthwhile and interesting, but we accepted them primarily because of their illustrations. For the purposes of the UL, while the novels themselves are unlikely to be heavily used, the illustrations are much more interesting. All books in this series have woodcuts created specifically for the publications. They are in general by illustrators who are represented elsewhere in the UL. The novels sometimes appear elsewhere in the UL, sometimes not. Written by Claude Anet, the pseudonym of Jean Schopfer (a writer and tennis player), this novel was adapted several times for cinema– most notably for a 1957 film by Billy Wilder. Cambridge libraries have numerous copies of the novel (and English translations). This edition, which stands at 2016.9.4412, has 29 woodcuts by Angelina Beloff. Written by Henry Bordeaux, our copy (2016.9.4413) in this series is illustrated by Jean Constant Raymond Renefer, who illustrated one other book from the collection in the UL. He was primarily a painter, most well-known for his paintings of soldiers during the First World War.